We provide flooring selection for all areas of your church campus. 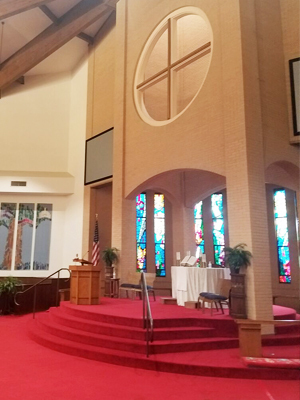 From the sanctuary and vestibule to the parish hall, classrooms and meeting centers, Hick’s has affordable flooring options to meet your needs. But Hick’s delivers more than great flooring products, we provide installation and renovation. From new construction flooring installs to removing dated worn flooring from your place of worship you can count on us. Hick’s Carpet One is San Antonio’s carpet and flooring experts since 1935. Visit our new location to see all the carpet and flooring options available or schedule an appointment with one of our flooring specialists today. Contact Hick's Carpet One and get a free quote on flooring options for your sanctuary today.